Try the Season 1 Colorverse Spaceward fountain pen ink without purchasing a full bottle. 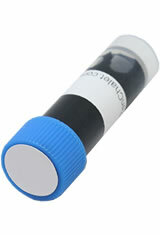 Each 4ml ink sample comes in a plastic vial with a cone shaped bottom for easy filling of your fountain pen. The Colorverse Spaceward Sample(4ml) Fountain Pen Ink usually ships within 1 business day unless otherwise specified. Each Colorverse Spaceward Sample(4ml) Fountain Pen Ink we sell is guaranteed to be genuine, authentic and will arrive brand new & unused! I like this ink. It is a wonderful mix of blue/green and turquoise. Everything about it is very good. Try it!